Started in 2009, the Eurocom Education Program was born out of a desire to give back to the community and provide students with the tools necessary to be as innovative and future forward as possible. 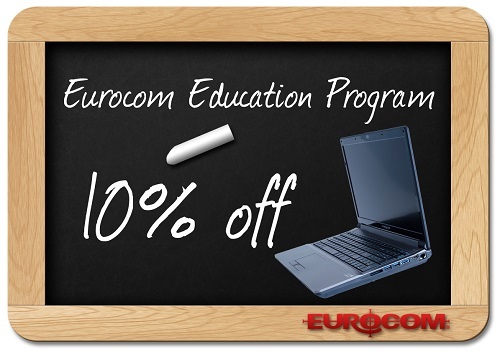 The Eurocom Education Program provides a means for students and educators to receive a high quality premium notebook at a special price. “It’s more than just a discount”, explains Eurocom President Mark Bialic. “This is Eurocom’s commitment to the future. Our company has always been future forward, so it makes sense for use to invest in students and those who teach them”. The Eurocom Education Program is available worldwide to all students and those employed at educational institutions. Students can configure their Eurocom Laptop or Mobile Workstation because Eurocom systems are customizable at the point of purchase, allowing customers to construct a system to be the ultimate technological companion in their studies. Eurocom understands the financial cost of becoming one of the world’s best and brightest as well, it’s why students and educators get our systems at a ten per cent reduction. An Engineer who transferred into mass communication at the University of Iowa’s prestigious Green Lee program feels the same. “From 3D rendering at school to gaming at home, my Eurocom has excelled at everything it does. The response on opening files, including large ones is snappy and quick. I couldn’t have asked for a better laptop for my engineering program or the mass communications program,” he said. “The student’s normal notebooks usually don’t have the memory or clock speed to run Computational Fluid Dynamics simulations. And that’s why I offer students the use of Eurocom laptops in my office” explains an engineering professor from University of Northwestern, in St. Paul. “It is difficult for me to select just one quality of the laptop that I like, as I have very few dislikes about it. One of the best aspects to me is the keyboard. As a person who uses a mechanical keyboard with Cherry MX switches whenever possible, the feel and travel distance of the keyboard is a very welcome change for chiclet keyboards. The sheer power and versatility of the laptop is also exceptional as it does everything that I need now and for the considerable future,” Said, Graeme, of the Waterloo Mechatronics program. Students looking to explore the range of customizability and quality of a Eurocom system are encouraged to visit our website, eurocom.com or by contacting our sales team at sales@eurocom.com.